This week, members of the ATS Research Advocacy Committee, chaired by Linda Nici, MD, brought their message of the urgent need to increase NIH funding to Capitol Hill. Committee members traveled from Arizona, California, Illinois, Indiana, Louisiana, Mississippi, Tennessee and Rhode Island to Capitol Hill to meet with more than 25 Senate and House offices including personal visits with Senator Jack Reed (D-RI) and Ron Barber (D-AZ). The committee came to Washington, D.C., to advocate for increased health research and services funding for the National Institutes of Health; Centers for Disease Control and Prevention, including the asthma, tuberculosis and National Institute of Occupational Safety and Health programs; and the Veterans Administration Research program, including an upgrade of the VA's aging laboratory infrastructure. Additionally, ATS members advocated for increased support for pediatric lung research and healthy equality. RAC members participating in the Hill Day included Linda Nici, MD, Rajesh Baghat, MD, Lynn Gerald, MD, James Brown, MD, Stephanie Davis, MD, Jeffrey Jacobson, MD, James Klinger, MD, Daniel Salerno, MD and PAR members, Teresa Barnes and Katharine Kroner. 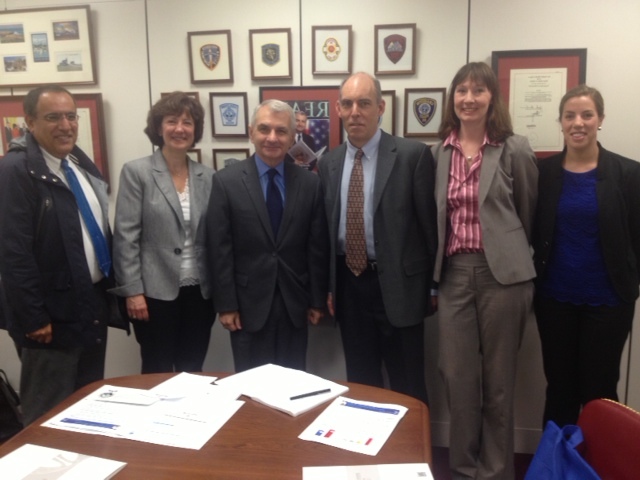 From left to right, Rajesh Bhagat, MD, Linda Nici, MD, Sen. Jack Reed (D-RI), James Klinger, MD, Nuala Moore, ATS staff, Jill Brimmer, staff to Sen. Reed.